A new study, involving a Michigan State University researcher, has found that higher rates of Flint children showed elevated lead levels in their blood during drier months of the year, even before the switch to a new water supply. The findings suggest that lead contaminated soil is most likely the culprit especially in the older, more industrial areas of the city. The research is published in the International Journal of Environmental Research and Public Health. "We have known for a long time that soil lead is an issue," said Rick Sadler, a public health expert in the College of Human Medicine, who has grown up in Flint and is helping the city combat the lead problem through his research. "It's not worse in Flint than in any other older, industrial city. But when you combine the exposure from soil with Flint's water problem, you see a magnification of the effects." Since 2010, lead blood levels were consistently higher during the months of July, August and September specifically in kids living within the city. In 2014 and 2015, levels rose about 50 percent higher. The city's water supply was switched in 2014. "This pattern of routinely peaking in the third quarter each year, as it normally does in urban areas, is mainly because of drier weather where there's more dust from contaminated soil in the air," Sadler said. "The bigger increase in 2014 and 2015 reflects the onset of elevated water lead levels." 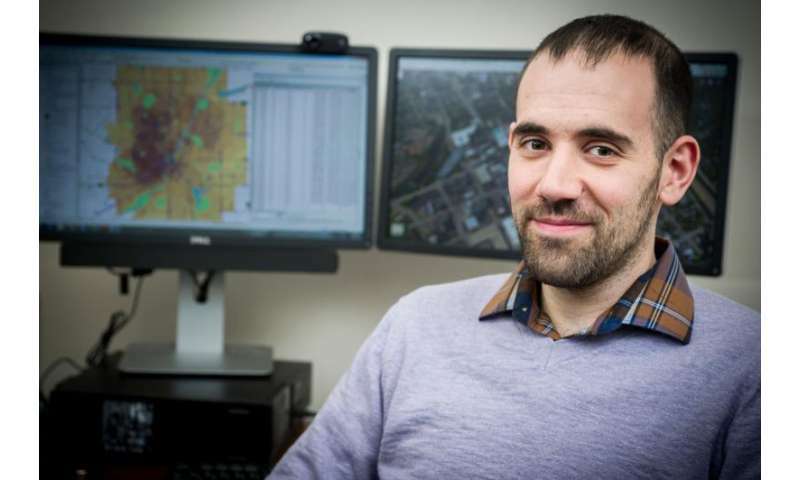 Sadler, who assisted lead authors Mark Laidlaw and Andrew Ball from Royal Melbourne Institute of Technology, or RMIT University, in Australia by mapping out soil lead levels in and around the city, said the findings help bring better context to the problem in Flint. "Typically, wealthier populations are able to buffer themselves from these issues because they live outside the more urban areas, so the brunt of the problem falls on the disadvantaged," he said. "It's important to note that nearly all Flint soils are well below the EPA threshold, but the locations that are problematic tend to be the lower income areas where people are already struggling to survive." Sadler, along with other organizations such as Edible Flint, have been working to address the issue for many years by advocating and making people aware what areas are of concern through soil sampling. "Even though methods like this have been in place for several years and lead exposure is way down from 50 years ago, the problem is still pervasive," Sadler said. "It's not as simple as just removing lead paint from houses or changing the chemistry of a water source. It's a big job." Sadler indicated that the problem now becomes more about political will. "It's going to take a lot longer than the five years some political leaders have promised to remove all the sources of lead in the environment," Sadler said. "We could be looking at more like 20 to 25 years. And it's important that our government leaders don't turn a blind eye and forget about these other environmental issues once the water situation has been cleared up." Gabriel Filippelli, Indiana University, along with Christopher Gonzales and Howard Mielke, Tulane University School of Medicine, were also part of the research team. Video: How can chemistry help prevent another Flint water crisis?